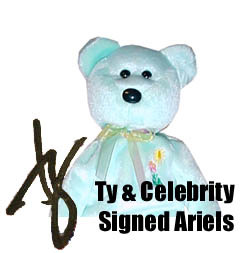 During an annual Kids for Kids event held to raise funds for the Elizabeth Glaser Pediatric AIDS Foundation in New York City, many Celebrities signed over 50 Ariel Beanie Babies to be auctioned off on the Ty.com TyTrade website. Each Beanie is not only celebrity signed but also signed by Ty Warner himself! For more information about why Ariel was Created Click Here! Join Grammy Award winning "Best New Artist" Christina Aguilera in San Diego on October 10, 2000 as she performs your favorite hits from her multi-platform album during her very first headlining concert tour. limousine ride to and from the event, you will also be escorted backstage to meet and, circumstances permitting, be photographed with Christina before (or after) the concert because your package includes two impossible to get backstage passes! Make sure you have your cameras (and smiles!) ready. Additionally, you will be presented with an "Ariel" Beanie Baby that has been hand autographed by Christina. To recap, this auction includes the following: 2 Concert TICKETS and Backstage Passes for the October 10th 2000 Concert in San Diego, California at Coors Amphitheatre. 2 round trip Air Line tickets (within the continental U.S.) provided by Continental Airlines to the Christina Aguilera concert. 2 Nights Accommodations at the Loews Coronado Bay Resort, San Diego, CA. Limousine transportation to and from the event provided by Precision Limousine. An "Ariel" Beanie Baby hand autographed by Christina. AUTOGRAPHED ARIEL BEANIE BABIES ! The Britney Spears autographed Ariel Beanie Baby sold for $1,520 US on Ty Trade on October 25, 2000. The picture to the left was featured on the TyTrade website during this auction. This auction included 5 Autographed Ariel Beanie Babies all included in one auction! 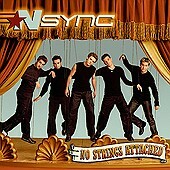 This auction was put up on Ty Trade on November 2, 2000 and had five Ariels, each signed by a member of the five member pop music band, *NSync. These Ariels sold for $2,550 with a total of nineteen bids. The above image and the following two images and text are from the www.pedaids.org website! Please visit them and give them your support! 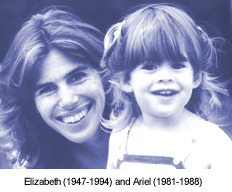 In 1986, Elizabeth and Paul Glaser discovered that Elizabeth and their two children, Ariel and Jake, were infected with HIV. At that time, HIV infection rates were rising rapidly among children.There was no coordinated research of the disease's effect on children and none of the drugs used for treating adults with AIDS were tested or approved for children. In an effort to save Jake's life, Elizabeth joined two friends, Susie Zeegen and Susan DeLaurentis, to create the foundation that now bears her name. 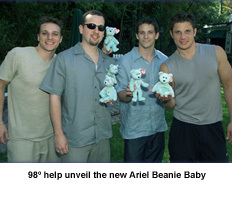 Ty, Inc. auctioned Ariel Beanie Babies, autographed by some of your favorite celebrities, including 98 Degrees.